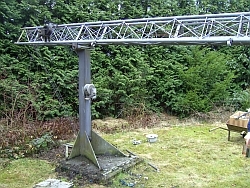 OK, just had an email from my little brother, asking if I know anyone who would like a radio amateur aerial mast, and various bit's and bobs - as per the two pictures. They are free to anyone who would like to go and take them down and remove them. I'm not sure where they are, but my brother lives near Bedford, so presumably down that way? - I'll contact him to ask, so if anyone is interested please mention it here. That looks very much like a "Versatower" - is it a trailer-mount version or the fixed base one, as in the photo below? Also, can you find out what height version it is? No use to me but there is another ham nearby who may be interested..
Edit - just spoken to him, it's too far and too difficult to transport. Sorry, he mentioned it was 2 x 25 feet. I also presumed it was concreted in.